Come to Get Immersed! Ian Hunter from New Deal Studios and Scott Broock, VP of Content at Jaunt will speak about 'A VR Film in All Its Parts" and will share their stories on how they are creating memorable immersive virtual reality experiences with explosive VR content for devices such as the Oculus Rift. 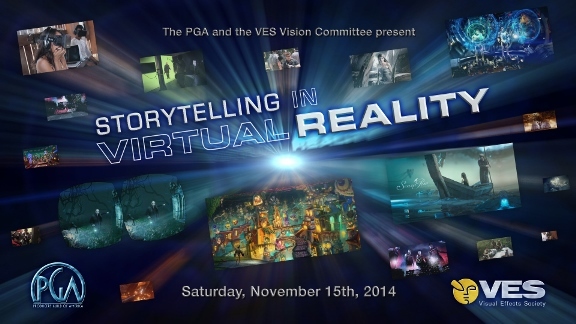 Ian Hunter and David Sanger from New Deal Studios will be speaking at the VES/PGA Virtual Reality event this saturday! Looking forward to seeing you there! New Deal Studios will be heading to the Engadget Expand in the Big Apple November 7th and 8th. Stop by to watch our trailer for VR short film "The Mission". New Deal Studios will be presenting our newest trailer for the cinematic VR short film "The Mission" at Comikaze in booth #864. Stop by, say hi, put on one of our VR viewers and be one of the first to get a taste of this immersive VR experience.